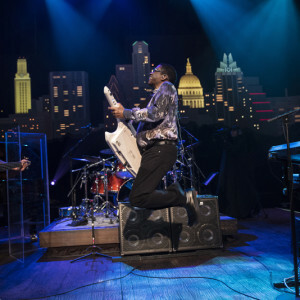 Austin City Limits presents a series highlight: a career-spanning hour with one of the world’s most celebrated artists, jazz legend Herbie Hancock, in his first-ever appearance on the program. Hancock opens the hour with an early gem, “Cantaloupe Island,” from his 1964 album Empyrean Isles. 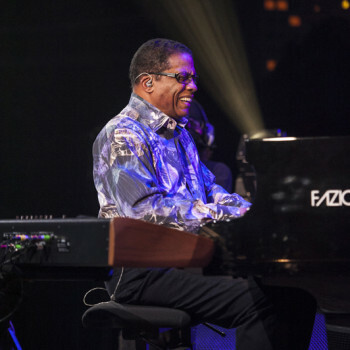 Originally composed during his time in Miles Davis’ second great quintet of the Sixties, Hancock thrills with a new take on a modern standard, showcasing his remarkable touch on the piano, anchored by the number’s iconic riffs. Playing with a palpable pure joy, the Grammy-lauded giant is exhilarating to watch, ageless six decades into an extraordinary career. The bandleader shares the ACL stage with a seasoned jazz combo comprised of bassist James Genus, saxophonist/keyboardist Terrace Martin, and drummer Vinnie Colaiuta. 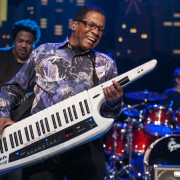 Hancock pivots to his Korg Kronos synthesizer for the futuristic, ambient opening of “Overture,” before spotlighting his band of aces as each player answers the call with elastic, playful chemistry. He takes the mic to say, “We like to go a little crazy up here sometimes,” to the crowd’s delight, before launching into “Secret Sauce,” a new composition that begins with him on vocoder and a thrusting synth and bass groove, breaks down to near-silence, then slowly simmers to a boil, with Hancock masterfully commanding his synth and piano simultaneously. The band closes out the stunning set with the funk classic “Chameleon,” from 1973’s landmark album Head Hunters, as Hancock takes center stage with his white keytar, dazzling with jaw-dropping solos as the crowd responds in rapt appreciation. Tune in this weekend for this episode, and, as always, check your local PBS listings for the broadcast time in your area. Go to the episode page for more info, and don’t forget to click over to our Facebook, Twitter and newsletter pages for more ACL info. Join us next week for another brand new episode, featuring hip-hop superstars Run the Jewels.